More than 300 possible extremists have been arrested in Spain since the 2004 Madrid commuter train bombings. Madrid, Spain (CNN) -- A Spanish court convicted 11 Islamic militants Monday of membership in a terrorist group, but acquitted them of a "specific" conspiracy to carry out an attack on Barcelona's metro subway system, as prosecutors alleged. The court instead said there was a more general decision by the group, linked to al Qaeda, to use explosives against Barcelona's metro, but that a specific date and place had not been determined, nor had a sufficient amount of explosives been assembled, according to a copy of the sentence viewed by CNN. The judges ruled the alleged Barcelona plot had "not advanced sufficiently" to constitute a crime of conspiracy under Spanish law. The alleged plot in January 2008 had raised alarm bells in Europe because Spanish authorities said there were to be a series of attacks, starting with suicide bombings on the Barcelona metro, and then other attacks in Spain, Germany, France, Portugal and Great Britain, if successive demands from a Pakistani Taliban leader and al Qaeda were not met. The trial against 10 Pakistani men and an Indian national was held last month. All proclaimed their innocence and many refused to answer prosecutors questions. The three-judge panel at the National Court ruled on Monday that all 11 belonged to a terrorist group. Two of the 11 also were convicted of possession of explosives, but nine others were acquitted on that charge. The 11 face prison terms of eight to 14 years. But Jose Maria Fuster-Fabra, a private prosecutor representing victims in the case, told CNN the sentence sets a precedent in Spain because the 11 defendants were convicted for terrorist group membership almost solely on the basis of a key police informant, known as F1 to protect his identity. F1 testified he was selected by the group's leader to be a suicide bomber, and that he quickly made a secretive call from a bathroom at a Barcelona mosque to warn a friend in France about an impending terrorist attack. Hours later, police swooped to make arrests in January 2008 in Barcelona. The protected witness denied on the stand that he worked for French or any other secret service. Defense lawyer Jacobo Teijelo, on the team representing all 11 defendants, said the sentence lacked judicial merit and he vowed to appeal to Spain's Supreme Court. About 30 members of Barcelona's large Pakistani community watched the trial almost daily in a bulletproof basement courtroom at the high-security National Court in central Madrid. A community leader told CNN the defendants were innocent and that the Pakistani community in Barcelona was hardworking and law-abiding. 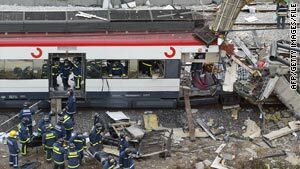 More than 300 suspected Islamic extremists have been arrested in Spain since the Madrid commuter train bombings that killed 191 people and wounded more than 1,800 on March 11, 2004, Spain's interior minister has said.